Black wattle | Infonet Biovision Home. 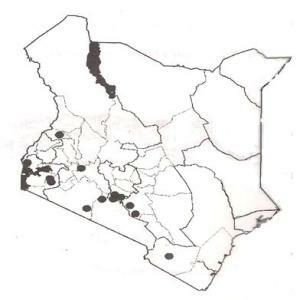 English (Black wattle); Kamba (Munyoonyoo); Kikuyu (Muthanduku); Kisii (Omotandege). It originated from Australia and it has since found its way to both temperate and cool tropical highlands. The specific name mearnsii was taken from A.R Mearns (1856 - 1916), an American army Surgeon who collected the type specimen form a cultivated tree near Thika in Kenya and the name was published for the first time in Pl. Bequaert in 1925. It is a tree for woodlots and a potential weed on farmland which can be difficult to eradicate. It should not be intercropped with food crops; it competes for nutrients and light with them resulting in low productivity. It is propagated from seedlings and direct sowing at site. They grow faster but are short lived. They are thin if established by direct sowing at site and they don't coppice well. A. mearnsii usually occurs in Plantation and woodlot. Harvesting of ten-year-olds result in the loss of large quantities of soil nutrients, application of lime has also been found to considerably increase productivity. Taproot development largely depends on how deep are the soils but it has the general tendency of developing a superficial lateral root system. Due to this, trees are liable to being uprooted by strong winds during the heavy rains. Fuel; though originally distributed for tannin extraction, its an important source of firewood and charcoal. Timber; produces good quality poles, posts and tool handles. Apiculture; produces many flowers which makes it a suitable source of bee forage. Fibre; It produces good quality fibre (bark) and also it can be used for rayon. Tanning; it is a source of tannin dye stuffs. Erosion control; black wattle on slopes controls soil erosion. 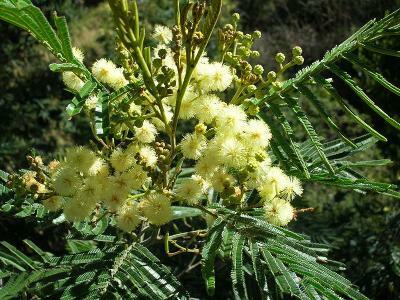 Ornamental; Black wattle is an attractive tree due to profuse flowering and hence ornamental. Nitrogen fixation; it is an effective nitrogen fixer. In wetter conditions of above 3,000 mm of rainfall annually it is susceptible to attacks by insects and fungal diseases. Diseases and insect pests associated with black wattle include; damping-off, white grubs, grasshoppers and cutworms for S. Africa and in Australia, the leaf-eating fire blight beetle (Pyrgoides orphana) is a serious pest. Loranthus termites and a number of other insects have been identified to cause problems in Tanzania. In Brazil, beetles girdles twigs and branches causing great havoc.